Yet another, not a less helpful option is importing hashes from the system restore folders. All you would need for that is to specify the path to one of the disks. 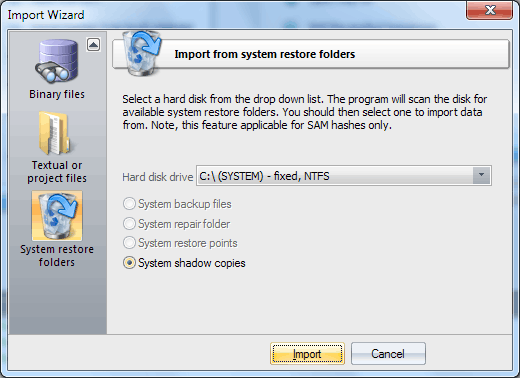 The program will automatically find the recovery folders and, if it finds the necessary files, import the hashes. The search is performed, first of all, in the system directory. Second, in '%Windows%\Repair' folder, which normally contains system registry backups. Third, in the 'System Volume Information' folder, which is used for undoing changes made to the system. This technology has been available since Windows XP and is also known as System Restore (XP) or Shadow Coping (Vista+). Be careful though, the registry backups may contain obsolete data!